Recover My Files is file recovery and disk recovery software with specific support to recover deleted ZIP files. Recover My Files also specifically supports the recovery of more than 300 files types, including other compression formats such as RAR, GZIP, TAR, LZH and CAB files. From a RAW or corrupt disk. 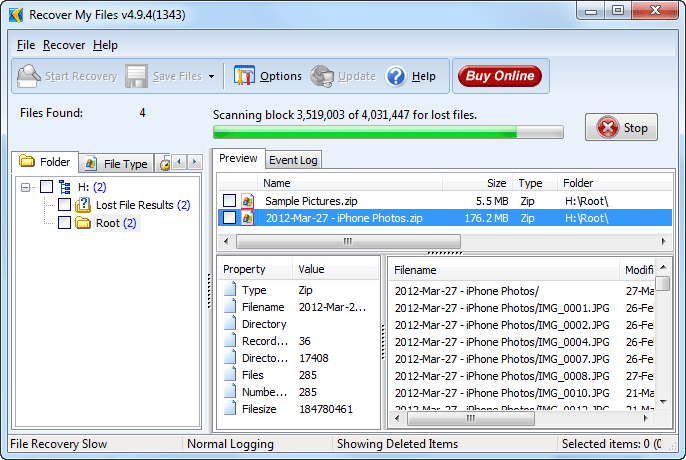 The screenshot below shows a search for deleted Zip files on a USB device. Click on the files found in the search results screen to display a list of zip files contained within each file. Use this information to determine if your zip recovery is successful and then purchase an activation key to save the files to another drive.